When it comes to installing piping for sewer systems, drains, and septic tanks, you can trust we are experienced and qualified to perform the job. At Kitchener Plumbing Services, we use only the safest and most up to date methods, and are there for offer any cleaning necessary of exiting septic or sewer systems. Sewer pipe repairs in Kitchener may not be the most glamorous job, but if we didn’t do it, who would? Any type of system, whether it be a sewer or septic tank; needs regular cleaning and maintenance. With clogs and blockages you can only imagine the mess and can guess why plumbers are in demand. While we do our best to prevent clogs and blockages in your systems, they do occur. The last thing you want is a backed up sewer system or septic tank. You never know when a foreign object is causing blockage. We have skilled plumbers and tools to assess the situation to find solutions. At certain times, you may need your lines relined. Trust our services to get the job done right! We have plumbers available 24 hours when emergencies hit. We can handle any drain problem or clogged underground pipe issue. We thoroughly repair sewer systems to get things up and running and back to normal. With underground sewer pipes and systems, we use different laser and thermal methods to find the root of the problem. We also have trained professionals who specialize in this type of plumbing problem. Sewer systems can sometimes be complicate and complex. That’s why you need the experts. With many types of debris running through a sewer line at any given time, you’re bound to have problems. We use safe detergents and cleaners to flush through sewer systems, saving you the mess and stress. We solve odor problems, and evaluate the situation before any work is done to guarantee we’ve found the sole problem. Messy back ups, odors, clogged drains and pipes are somethings that no home owner, restaurant owner, business owner or employee wants to deal with. That’s exactly why you have our plumbers in Kitchener and Waterloo. Here at Kitchener Plumbing Services, we use a variety of different tools and methods to install or clean your underground systems. We clear out food, tree roots, and more with our specialized techniques. We use cabling, often called snaking to unclog your blockage. We also use loaded metal to run through blocked piping at high speeds. We unclog whatever is snarled in the piping to restore order and function to your system again. 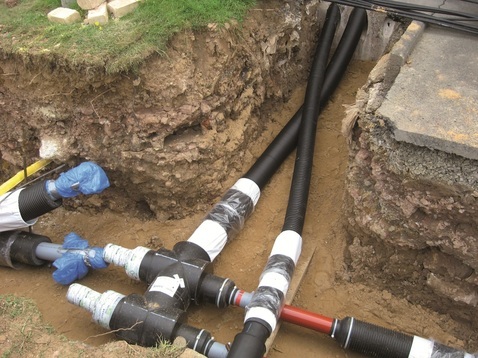 We also completely install or tear out old underground piping systems. Another method we use is called auguring. This is especially used with toilets and urinals. An auger is much smaller, but performs the same basic function as a snake. We also offer hydro-jetting to flush out your systems. Whatever method or tool we use, you can trust we are experienced in solving your plumbing issue. Having a serious plumbing issue is never enjoyable. Whether you require a full on repair of underground pipes or a deep cleaning for your drain or sewer system, we can do it all. Call Kitchener Plumbing at 226-400-6015 the next time you have a plumbing leak emergency or just a simple question. We are here to meet all your plumbing needs and expectations.